I’m so excited to have Jane Tanner, co-founder of the kids’ book subscription service, Bookroo as guest post-er on This Picture Book Life today! 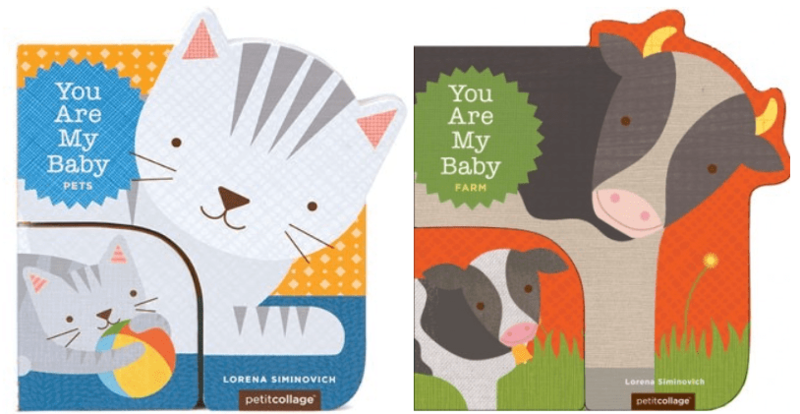 She’s going to give us seven of her favorite and completely awesome board books for the littlest readers. Over to Jane! 1. Moustache Up! A Playful Game of Opposites by Kimberly Ainsworth, illustrated by Daniel Roode. Mustaches are definitely in right now, and this book pays playful homage to the trend, while at the same time being chic and interactive. The text of the book is all in delightful rhymes, which are catchy and keep you moving on, and the drawings are minimalist and high contrast. Possibly the best part is the packet of sturdy moustaches at the beginning of the book that kids can match and stick into the pages of the book, or play dress up with. 2. You Are My Baby series by Lorena Siminovich. The first time I came across one of these books (the Ocean edition! ), I was in absolute raptures. We live in a world of square books, which is great and all, but the You Are My Baby series’ unique shapes make them that much more special right out of the gate. And, it’s like two books in one–the baby book, and the parent book. The illustrations are modern, clean, and adorable, and it teaches children some less-well known names for baby animals, which is a plus! 3. 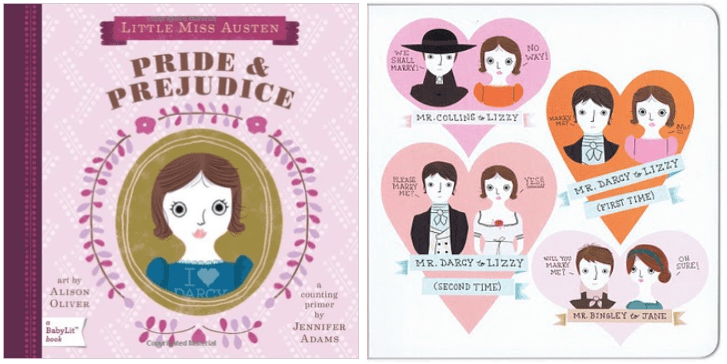 Pride and Prejudice: A Baby Lit Counting Primer by Jennifer Adams, Illustrated by Alison Oliver. Jane Austen’s Pride and Prejudice is my favorite book of all time, and so my mom bought this board book for me on principle. It’s an adorable counting primer with modern and spunky illustrations that give little ones something to look at and count while we get reminders of all our favorite parts of the original. As a side note, all of Baby Lit’s books are great introductions to classics, displayed in a beautiful, child-friendly way. 4. 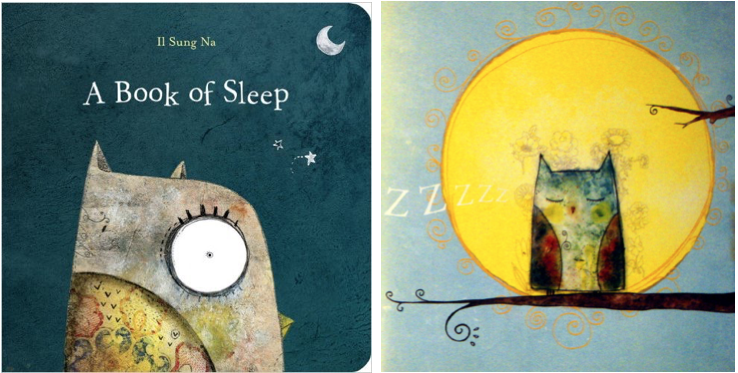 A Book of Sleep by Il Sung Na. A Book of Sleep is an absolutely delightful bedtime choice, with illustrations so unique and beautiful that I found myself fascinated by them instantly. Children and adults will enjoy the mix of textures, colors, and patterns interwoven throughout the illustrations as the story follows an owl as he watches over all the other animals falling asleep. The book teaches about sleeping habits of various animals, and also gives children an opportunity to play “I spy” as they watch for the owl on every page. 5. Hopper and Wilson by Maria van Lieshout. The watercolor illustrations in Hopper and Wilson are absolutely whimsical and delightful. It tells a story of two friends, a mouse and an elephant, who go on an adventure to find the edge of the world where they hope there will be endless lemonade and the opportunity to touch the moon. While they get separated along the way, (spoiler alert!) they find each other again, and the book creates openings for discussion about the importance of friendship, not giving up, and the earth being round and not flat! 6. Owl and Friends by Joyce Wan. You’ll probably be as impressed as I was when I discovered that Joyce Wan can even make worms look cute! All of the illustrations are clean and simple, yet utterly delightful! 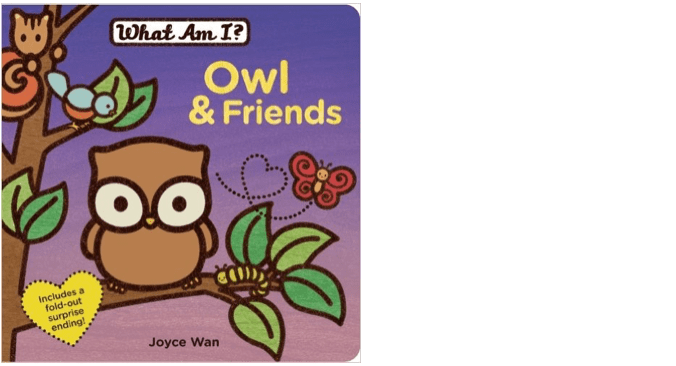 Owl and Friends introduces young children to a variety of animals and what they do, and features a fun foldout at the end. The Pout Pout Fish by Deborah Diesen, pictures by Dan Hanna. 7. Pout Pout Fish is a New York Times Bestseller and teaches the classic and ever important lesson that happiness a choice. The text is fun and rhyming and I’ve even heard people turn it into a song as they read, although I’m not that accomplished! The illustrations are fun, expressive and detailed, giving opportunity for parents to point out things other than the main story in the sea surroundings. Thanks, Jane, for the awesome list! Bookroo empowers parents to build their children’s book collections in an affordable and exciting way that inspires a love of reading in children by creating a delightfully whimsical experience. Each month Bookroo delivers 2-3 adorably wrapped, curated board or picture books to your door for you to keep! Retail value of the books always exceeds subscription price. Bookroo is generously offering a deal for This Picture Book Life readers! Get $4 off your subscription if you sign up though the link. And there’s one more special thing Bookroo is doing right now. If you purchase a subscription, you’ll get a coupon for a Bookroo box to pass along to a friend. Yup, buy one, give one! read the books, get or give bookroo! Such cute books! Always pained me to watch my little ones using their drooly mouths and sticky fingers to “read” – but oh how they loved them! What a cute idea…I may have to gift this for Maddy’s next b-day! Do you happen to know how long the subscription discount lasts?